Bakery lovers, have you tried all the yummy bakery scents from Food Network yet? This brand is found at Kohl’s and based off cold sniff, they sure smell yummy! Farmstand Apple Cider Doughnut smelled pretty amazing. 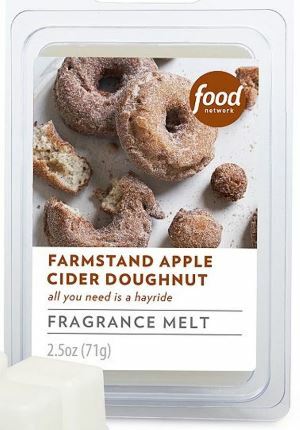 The scent… a warm and doughy fragrance with the perfect touch of baked apples and a hint of cinnamon. YUM!!!! Crisp apple cider with cinnamon and warm bakery dough. Mmm!! Yep, bakery dough all the way, my absolute favorite kind of bakery scent. warm doughy YUMMY melt-in-your-mouth bakery!! I used the entire clamshell pack (3 cubes each) in two electric melters in my great room. Once melting, it took roughly ten minutes or so before the aroma started moving through my living room and once it did… the most yummy and warm doughy apple cinnamon scent wafted all throughout my great room. The aroma wasn’t super strong but boy was it delicious and I think my favorite so far of all the Food Network scented melts I’ve tried. Just imagine warm baked gooey donuts with hints of sweet apples then covered in cinnamon sugar. Strength – on a scale of 1 to 10, I would rate this scent a 7 in a large room. Not super strong but gave a soft medium scent throw. 10 in a medium or smaller room.